Acts 11:29–12:2 on the recto side of Uncial 0244 (Gregory-Aland) from the 5th century. Acts 11 is the eleventh chapter of the Acts of the Apostles in the New Testament of the Christian Bible. It records that Saint Peter defends his visit to Cornelius in Caesarea and retells his vision prior to the meeting as well as the pouring of Holy Spirit during the meeting. The book containing this chapter is anonymous but early Christian tradition uniformly affirmed that Luke composed this book as well as the Gospel of Luke. 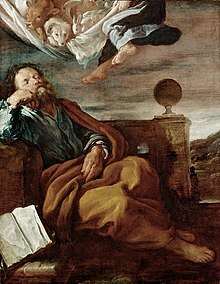 The vision of Peter, painted by Domenico Fetti. [The man in Cornelius's vision said:] And when he (Barnabas) had found him (Saul or Paul of Tarsus), he brought him to Antioch. So it was that for a whole year they assembled with the church and taught a great many people. This page was last edited on 23 April 2019, at 01:21 (UTC).